Paul Kitsos, 55, was enthusiastically headed to Las Vegas from his home in Long Island, New York, with $11,000 in cash on him, when he died of an apparent heart attack mid-flight. According to his wife he was going to the WSOP, where his record indicates he had plenty reason to believe he stood a good chance of making a big splash. For a little more about Kitsos’ life, here’s his obituary (with a few minor poker inaccuracies) in the New York Post. And here’re his Hendon Mob results, which show about $389k in winnings from 19 tournament cashes in a 5-year poker career. Most recently he took 2nd in a $300 US Poker Championships event — the “Rounder Girl Bounty” tournament — and 2nd in a $1,375 event at the World Poker Finals at Borgata. His biggest scores, $97k and $103k, came from two 5th place finishes — in the $5k WSOP-Caesars circuit main event in 2007, and the $5k Borgata Summer Poker Open main event in 2008. He has two cashes in the WSOP main event, finishing 468th in 2006 and 320th in 2008. Kitsos died with one 1st place victory under his belt, having bested a field of 231 to win the 2007 USPC Seniors event. Not sure why the Post chose to highlight Kitsos, nicknamed “Smalls”, as being “morbidly obese” in the lede of their obit. (They end so sweetly with the text from his autistic son who can’t speak.) In poker worlds, 350 pounds is hardly all that big — doesn’t even require a scooter! But I suppose size becomes a bit more relevant when in the throes of death in the confines of an airplane. His big score in the large-women’s fashion world, apparently, came when Patti Labelle wore one of his outfits on Wendy William’ daytime talk show. 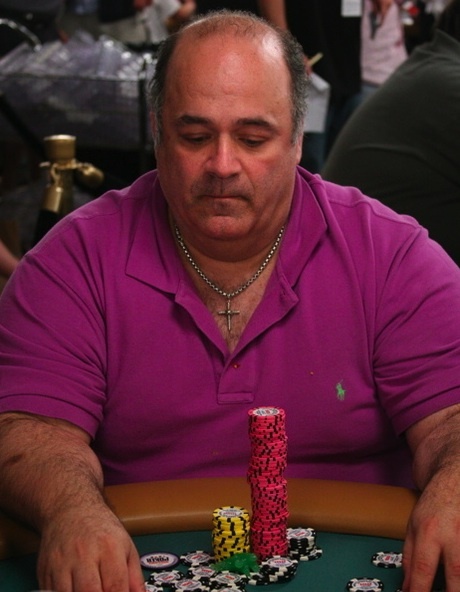 * CardPlayer’s Jeanine Deeb took the photo of Kitsos that is now propagating all over the internet, not Victor Alcorn, who gets credit in the NY Post. For a little more about Kitsos, you can also check out an article I did that includes comments from Matt Stout about Kitsos.